I can't remember being this late putting up my library loot post ever! Every night I have sat down to do it, but ended up needing to go to bed because I was so tired! I haven't done any blogging at all, and there is lots I need to do, and I haven't done any blog hopping either! I am hoping to catch up a bit over the weekend, but in the mean time here is my library loot, albeit a bit late! The Memorist by M J Rose- Recently I read the third book in the series, and then the first book in the series, so now I am planning to read the second book. I don't often read a series out of order. The Double Comfort Safari Club by Alexander McCall Smith - Yes, I have borrowed it again. Maybe I will read it this time. The Jewel of St Petersburg by Kate Furnivall - I have read a couple of books from Kate Furnivall before and really enjoyed them. This is the prequel to the first book I read which was The Russian Concubine. I am looking forward to reading it. A Kiss at Midnight by Eloisa James - The first book in a new series from Eloisa James. 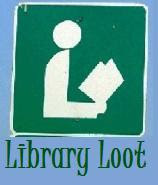 Claire has Mr Linky this week, so head on over and share your loot for this week. Oh I forgot, I did borrow a book this week 1001 night of snowfall, a cool graphic novel. Looks like some great loot. I can't wait to start The Jewel of St. Petersburg too. Oh Marg, I am totally in the same boat as you! No blogging, blog hopping, etc in the past few weeks. Terrible! But I'm glad to be back now after moving both my blog and my life (we moved into a new apartment this past week). I have THE JEWEL OF ST. PETERSBURG for review in one of my boxes somewhere. I started it the other day (before the move) and it had a beginning that instantly caught my attention. Allie and Darlene, I really liked the two books I have read from Kate Furnivall before so I am expecting to like this one too. Blodeuedd I haven't read a lot of graphic novels, but I did like the ones that I have read. I just won a copy of The Hypnotist and am excited to start with this series, it sounds so, so good! Isn't library day so exciting! I'm going to look up The Jewel of St. Petersburg--that looks very enticing. Thanks so much for your congratulations!